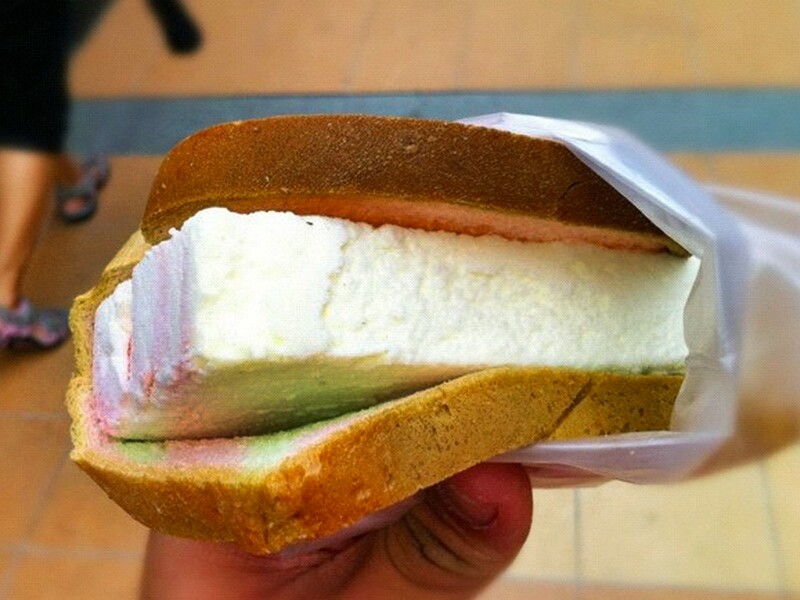 Few things are as popular across the world as ice cream. After being a luxury only the wealthiest in society could enjoy, the chilly treat is now available to each and everyone in all shapes and sizes. 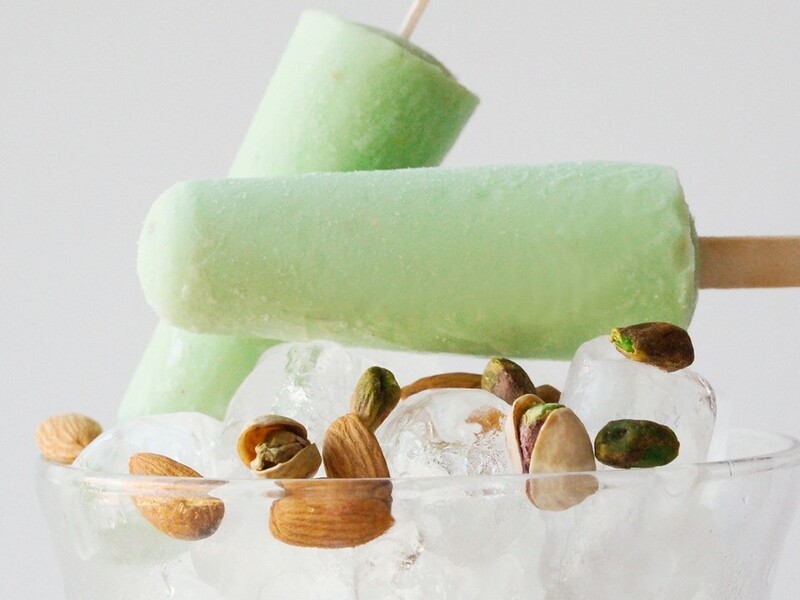 Here’s a list of the tastiest, strangest and coolest frozen desserts on offer worldwide. 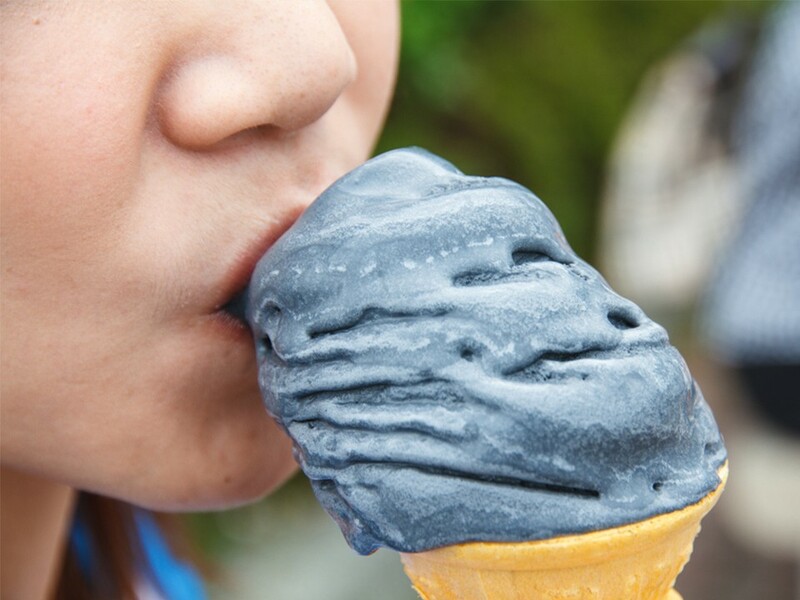 Ice cream is thought to originate from China?Many countries have laid claim to being the masterminds behind the frozen treat, but it’s probably China who invented the original concoction in 200 BC. Rumour has it that it was Marco Polo who brought it back and introduced it to the Italians. The world’s tallest ice cream cone was made in Norway?Measuring over 3 metres tall, the strawberry ice cream has managed to scoop up a Guinness World Records title. The cone itself weighed almost a tonne, and contained enough ice cream for a small town to sample! Last year, Americans ate 18.3 litres of ice cream per person? China may be the biggest market for ice cream, but when it comes to most ice creams eaten per person the US are still firmly in the lead. The most expensive ice cream can be found in Dubai?A country known for lavish indulgences, Dubai is home to an ice cream made of the finest vanilla, saffron and black truffle. Topped with 23 Carat gold and served in a Versace bowl, one single scoop will cost you a whopping £530! Gelato, ItalyWhat makes a traditional Italian-style scoop different from its chilly, cream-based counterpart is that it contains less milk fat and is churned differently, making it a thicker, tasty treat. Kulfi, IndiaStrikingly similar to the UK’s frozen custard, kulfi can be traced back all the way to the Mughal Empire. Clotted cream ice cream, EnglandMany a place around the UK have claimed ownership of the clotted cream ice cream. With a high fat content and a velvety texture, it’s a rich dessert best paired up with a cup of your favourite tea. Frozen yoghurt, USAOpting for regular milk instead of cream, fro-yo is a healthier alternative that comes in almost any flavour imaginable. Helados de paila, EcuadorDating back to the Inca era, this tasty treat is made by adding fruit juices, cane sugar and sometimes milk to a large pan, stirring it vigorously until it freezes. Halo-Halo, PhilippinesHaving contended closely with ‘the cronut’ on being the unofficial sweet treat of 2013, this Filipino ice cream shows having beans in a dessert might not be as kooky as it sounds. Ice Cream Breakfast, SicilyEver dreamed of having dessert for breakfast? Well, then a trip to Sicily might be just the thing you need – there you can join the locals in kick starting the day with a brioche bun filled with ice cream. Try this out by heading over to Sicily. Crocodile egg ice cream, PhilippinesIntroduced by an ice cream parlour in Davo City, ice cream made with crocodile eggs instead of ordinary ones from a chicken has proven to be a glowing success. Spaghettieis, GermanyAt first glance, it will look like you’ve been served a lacklustre pasta dish with a month-old tomato sauce on top. But looks are deceiving – it’s actually vanilla ice cream run through a rice maker, topped off with strawberry sauce. Fish ice cream, JapanKnown in Japanese as s aury , this saltwater fish is drowned in brandy to mask the potent scent. It’s a popular flavour in the country, so look out for it in ice cream parlours and stores. Akutaq, AlaskaInstead of cream, animal fat is used to create this classic local delicacy, with berries added for flavouring. Enjoyed as a dessert or a meal in its own right, it’s definitely something for the bucket list! Tiger Tail ice cream, CanadaUnique to The Great White North, this orange-flavoured sweet delight has liquorice chunks in it, creating a.. wait for it – stripey effect. Glow in the dark ice cream, AustraliaEver wondered what eating ice cream in the dark would be like? Liquid nitrogen ice cream comes in three fluorescent flavours, creating the perfect opportunity to match your snack with your threads at a rave. Potong, SingaporeIt’s time to add some carbs to your dairy diet. Wrapped in multi-coloured bread (yes, bread! ), this rich dessert is a great option for cooling down on a humid tour around the city. Brunch, IrelandThis national treasure, a bright-pink ice lolly covered in biscuit crumbs, can only be described as the sweet version of Marmite – you either love it or you hate it. Head over to Dublin to try one of these! Ca’n Joan de Saigo, MallorcaIf you’re in Palma, the place to be is Ca’n Joan de Saigo – an ice cream parlour which has been around since the 1700’s, becoming an integral part of the city’s history. Heladería Coromoto, VenezuelaThanks to an impressive 860 flavours in store, this venue has been featured in T he Guinness Book of World Records. It’s the stuff dreams are made of for all the ice cream lovers out there. 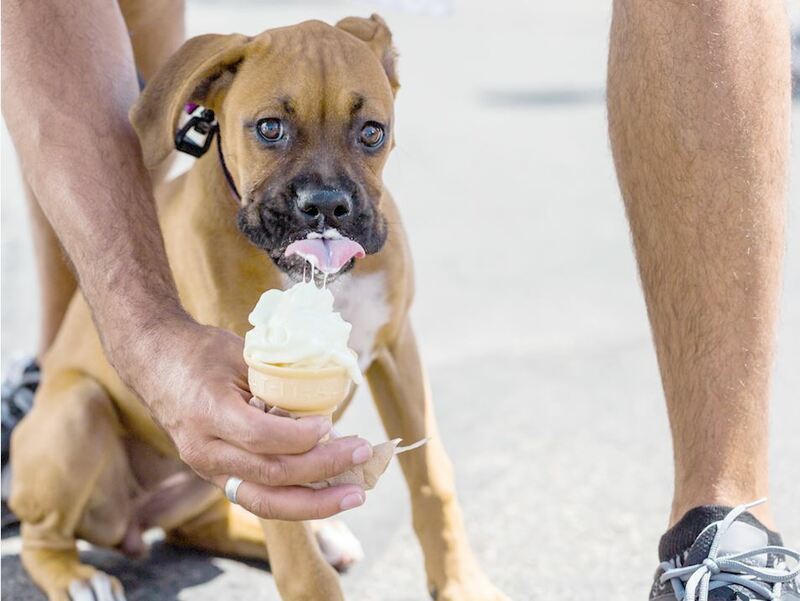 Pet Pavilion, UKIce cream for dogs is originally from the US, but is spreading like wildfire across the world. This fancy London gelateria is a perfect pitstop for pet pooches looking to treat themselves on a sunny afternoon. Here are some of our suggestions for places to stay in London. It’s-It ice cream treats, San FranciscoIce cream encased by oatmeal cookies and dipped in chocolate – there’s a reason I t’s-it has a 90-year-old legacy on their hands. Don’t worry if you’re not planning to be in the Bay Area anytime soon, their ice cream can be ordered online. Ice cream cupcakes, USAIf you’re ever in Beverly Hills, you need to stop by S prinkles and sample their menu. With a modern take on classics flavours like red velvet, there’s an ice cream for every palate to be found here. Queso, PhilippinesKnown locally as a variety of s orbetes , this cheese-filled ice cream is sold in colourful carts on city streets. Eat it in a cone, a cup or a sandwich – this cheddar delight is a lot tastier than it sounds. pistachios sprinkled on top of it. 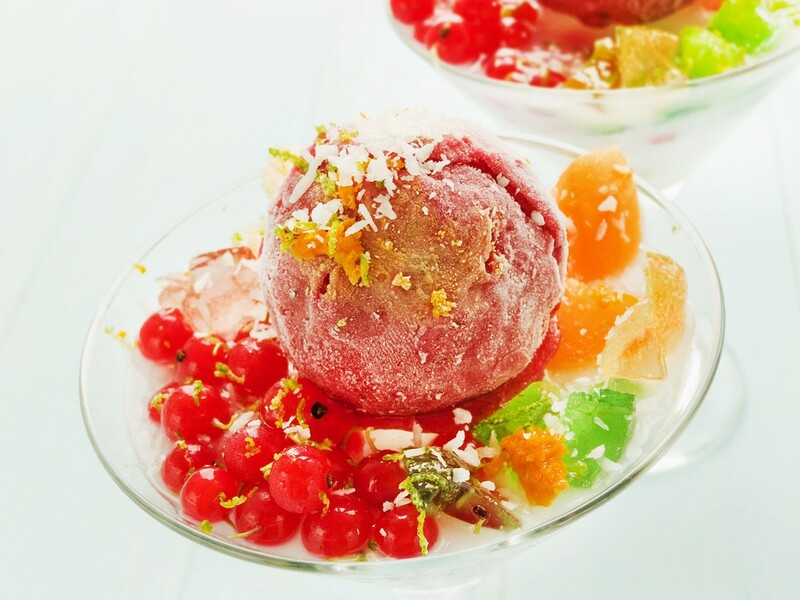 Faloodeh, IranNoodles aren’t the first thing that spring to mind when thinking about desserts. In Iran however, this is exactly what you’ll find. Semi-frozen with rose water and lime juice, Faloodeh is a refreshing way to cool down on a stuffy summer’s day. Helado de Queso, MexicoContrary to what the name suggests, this dessert doesn’t contain any cheese at all. Made with no less than three types of milk, it may look like a block of cheese during preparation but certainly won’t taste like one! Patbingsu, KoreaOne of the most popular summer snacks to be found in Korea is Patbingsu, made from shaved ice and red bean paste. Decorated with colourful fruits and rice cake pieces, it’s as much of a treat for the eye as it is for the taste buds. Turron ice cream, SpainMade from ground almonds and honey, Turron is a staple for any Spanish Christmas meal. In fact, it’s so popular that a Turron-flavoured ice cream has popped up as well. Cinnamon ice cream, MaltaServed at weddings, this is the dessert to make the church bells ring and taste buds sing. If you want to know what this one is like, head over to Malta and taste it for yourself! Ice cream cake, AustraliaThe coolest of cakes, this type works like a charm for birthdays and other special occasions down under. 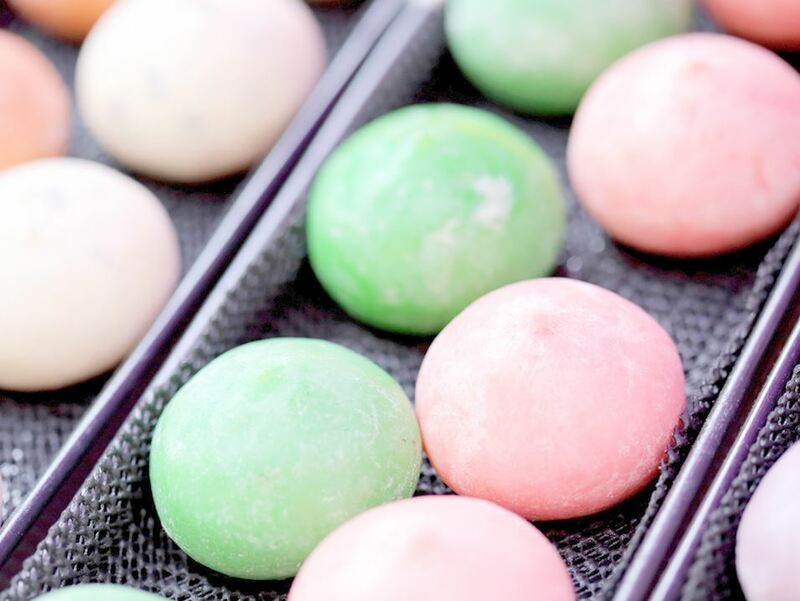 Mochi, JapanThese sticky rice cakes are a particularly popular choice for bringing in the New Year for the Japanese population across the world. Es Campur, IndonesiaA sweet, colourful dessert with several types of jelly to boast about, it can be found pretty much everywhere from food courts to fine dining restaurants. Açaí na tigela, BrazilHailing from the Amazonian region, with blended açaí pulp as the core ingredient, this healthy energy-boost is often eaten for breakfast or as a post-exercise snack. Paleta, Latin AmericaWith roots in Mexico, these small blocks of ice are packed with fresh fruit and whole berries. Choose between either a milk- or water-based option, both equally delicious! Dondurma, TurkeyChewy and stretchy are not two words you usually associate with ice cream, except for when it comes to this particular variety. 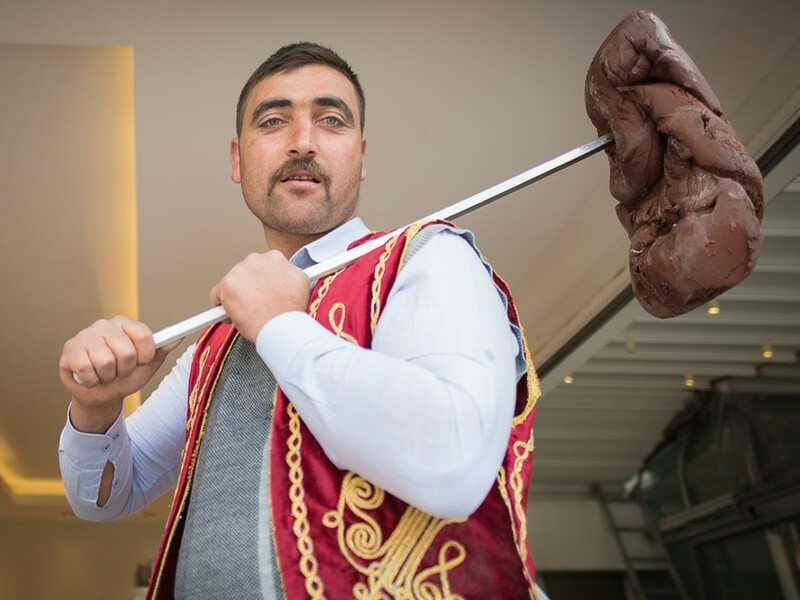 Made by Turkish street vendors, they make sure to put on a show when serving it. Check out our hotel deals in Turkey. Thai Roll ice cream, ThailandWithin the span of a few minutes, a street vendor will have put milk and fresh fruit on a cold surface, and mashed it into a cold paste. 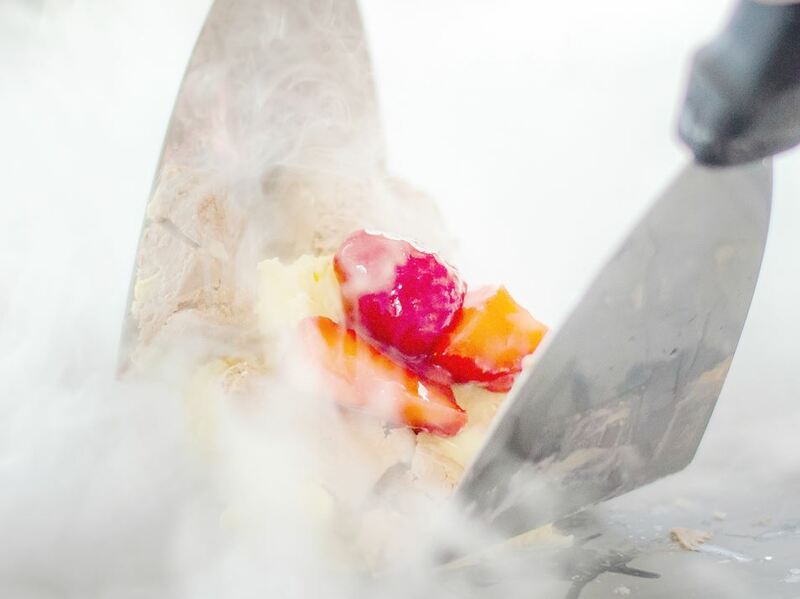 Watching it be prepared is as much of a treat as the ice cream itself!